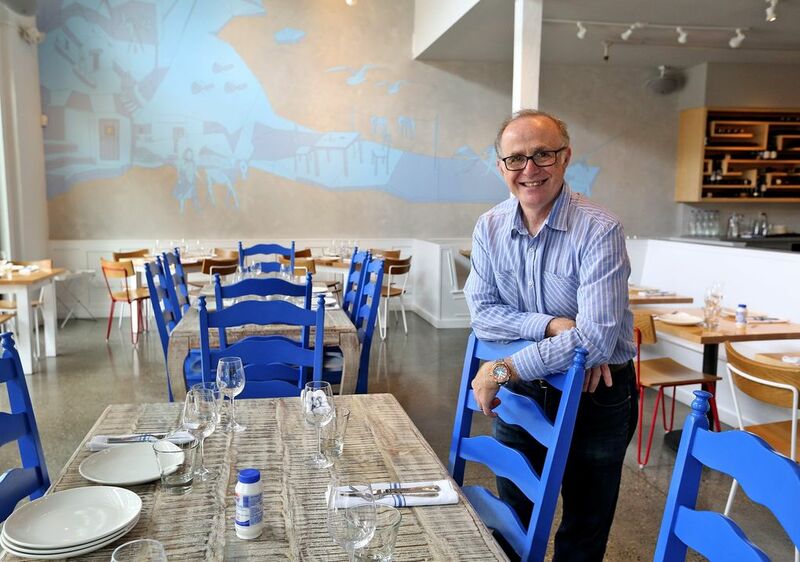 The longtime, Greek-born chef of Vios has opened an airy new spot on Capitol Hill. It’s an ouzeri, which specializes in small plates that traditionally accompany ouzo, wines or other spirits. Greek-born Thomas Soukakos started his hospitality career at 17 on cruise ships sailing from Piraeus, Greece. He settled for a time in Los Angeles but came to visit friends in Seattle, where he ended up finding a wife and opening his first restaurant, El Greco, on Broadway in 1994. By the time it closed 14 years later he had opened the hugely popular Vios Café on 19th Avenue East. A second Vios in Ravenna’s Third Place Books followed. 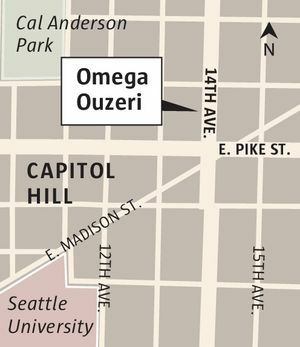 Omega Ouzeri, his new, airy, two-story Capitol Hill restaurant in the REO Flats building, is a big step up. 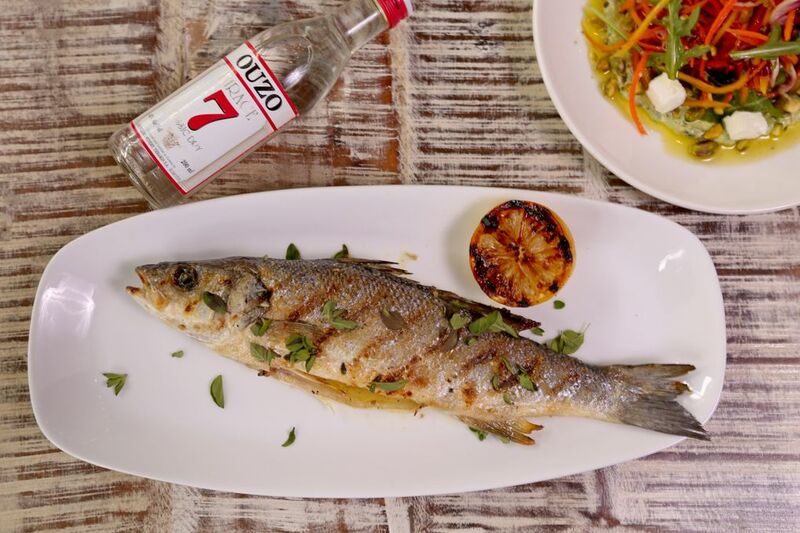 An ouzeri (pronounced oo-zeh-REE) specializes in small plates that traditionally accompany ouzo, wines or other spirits. I was in its thrall starting with the olive-oil martini made by infusing vodka with koroneiki Kalamata extra virgin olive oil from Greece. “A lot of things have to be good, but olive oil and honey have to be superior, because I love them so much,” Soukakos said, as he set a bowl of that spicy oil in front of diners. It comes with a basket of grilled Columbia City Bakery sourdough and a single koulouri, Omega’s own sesame-coated bread rings that are like Greek bagels — a bread service well worth $4.50. Who should go: a relaxed gathering spot for shared feasting with family and friends. Olive oil, honey, lemon and garlic. Oregano, mint, cinnamon and dill. These are pillars of this menu, recurring flavors that invigorate plate after simple plate, grounding them and letting them soar. Honey gilds desserts like dreamy chocolate, orange-blossom baklava and airy Greek doughnuts. Cinnamon perfumed creamy, vanilla-kissed rice pudding. On the savory side, cinnamon scented a tomato sauce that veiled smoky grilled eggplant and tart pearl onions, while a potent, much-reduced tomato jam escorted savory grilled meatballs, together with a dollop of luxurious, whole-milk Greek yogurt. Spicy garlic aioli anchored four golden brown zucchini fritters zingy with feta and mint. Crescent-shaped nettle pies made of phyllo contained those grassy greens creamed with shallot, garlic and lemon. Skordalia — a rough, lemony mash of garlic and potato — made a fluffy nest for fava beans and artichoke hearts, elegantly turned and trailing long, slender stems. 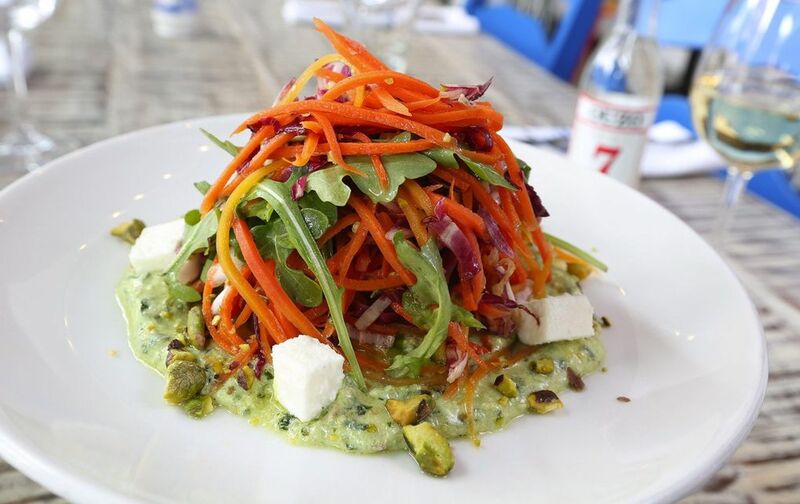 Radicchio and arugula brought bitter, peppery punch to slivered carrots mounded like a rainbow haystack above a thick, tangy whip of feta and pistachios. Greek salad is pared down to the essentials — cucumber, tomato, green pepper, red onion, feta and Kalamata tapenade — each element vibrant and fresh. Only once did I grab the shaker of Greek sea salt that sits on every table, to perk up an earthy, but under-seasoned puree of yellow split peas. Fresh octopus (from Spain) and whole branzino (farm-raised in Greece) chill on ice by the open kitchen, awaiting their turns on the grill. 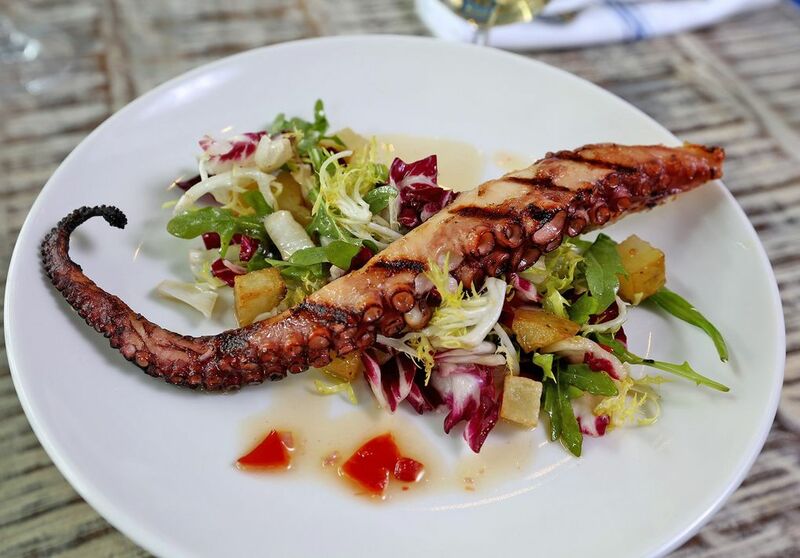 A delicately charred tentacle eventually embraced a gorgeous salad of bitter greens, browned potatoes and more octopus. Goat-horn chilies sparked its vinaigrette. Our waiter deftly filleted the glistening, grill-striped branzino at the table, removing the skeleton largely intact but cautioning that we still might find tiny bones. Prepared with olive oil, lemon and fresh oregano, the fish was exquisite. The same triumvirate anointed a brined, boned, flattened chicken leg and thigh, also flawlessly grilled. Lamb shoulder takes its time roasting in the oven. Chunks of it are served atop a minty lentil salad harboring fresh tomato, carrots and beets. A more piquant legume mix of black-eyed peas, roasted red pepper and Kalamata olives accompanied seared albacore rather too heavily crusted with fennel. Soukakos trusts the cooking to chef de cuisine Philip Busacco, most recently from Terra Plata, and sous chef Mike Kramer, but he is omnipresent in the restaurant: greeting guests, expediting orders, running plates and bussing tables along with his youthful staff. He’s an expert on the solid, all-Greek wine list too. Omega Ouzeri, named for the last letter of the Greek alphabet, is intended to be the ultimate expression of the Greek experience that Soukakos enjoys on annual visits to his homeland. 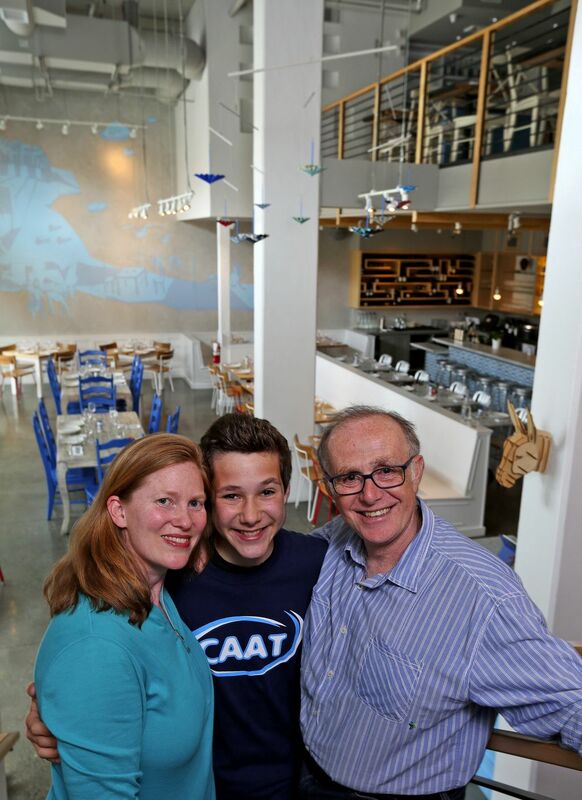 Designers there helped create the restaurant’s clean, contemporary look. Wooden banquettes are painted white. Honey-hued tabletops are bare. A bar and open kitchen run along the back wall, below a well-appointed loft for private parties. Sliding front windows invite in the summer breeze. The restaurant is a very personal expression as well. A dreamlike, misty blue mural on one wall evokes a seaside village with a scene that includes a young boy fishing, representing the chef’s teenage son, Alexander. Stenciled on the opposite wall are lines from Constantine Cavafy’s poem “Ithaka.” Its message: in life the journey may hold more rewards than the destination.